The other day I was talking with Shirley and her husband Nate when the topic of the "perfect album" came up. I'm sure we all have some of these in our lives- certain albums that we love from start to finish. No skipping songs, no getting tired of the beginning or end- just a perfect album with an ideal grouping of songs. I love all kinds of music, but for some reason when Fall hits I always seem to get a little more nostalgic and listen my favorite records more than usual. 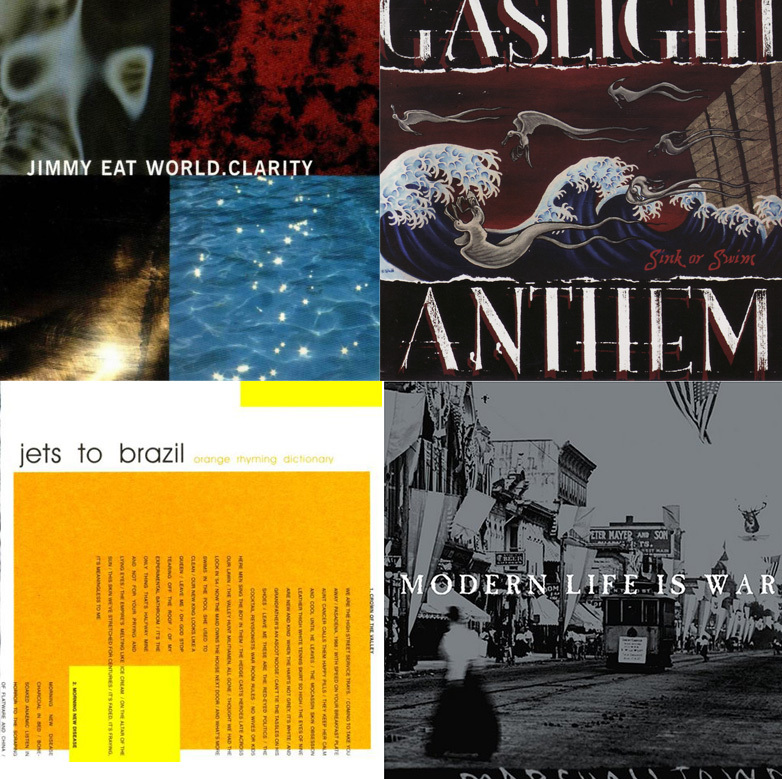 Maybe it has something to do with that familiar feeling Autumn brings, or remembering going back to school in late August and September, but whatever it is I always seem to gravitate to the music I loved most in high school and college. And as far as perfect albums, I have a few. Here are the four that came to my mind right away when thinking about it. I can still remember when I first heard this album. I was a freshman in college, dating a guy who was super into J.E.W. He played this album for me one night while we were hanging out and I fell in love with it upon first listen of the song "Table For Glasses." From there it was on my car's CD player and in my Discman (ha!) every single day on the way to class, and every night before I went to bed. I also have a vivid memory of driving home in a blizzard with Shirley, maybe sophomore year up in Flagstaff, listening to "Ten." I can still remember how quiet it was as we drove through all of that white, the music just barely in the background. This is probably my most favorite album of all time and it's another one of those bands I heard so much about but didn't listen to for one reason or another. One summer before my family and I left for our East Coast trip (I think it was 2007), Erin told me I just had to download some Gaslight Anthem to listen to while traveling. She had been trying to get me to listen to them for a few months and always told me how much I would love them. From being from New Jersey like me, having meaningful lyrics chock full of literary and Springsteen references, and dreamy vocals, she said this would be my new favorite band. She was right. I downloaded Sink or Swim and turned it on once we got on the plane...and was enthralled for the entire six hours. And I still am today. I had been a Jawbreaker fan in high school and really liked them, but they weren't my absolute favorite. I did love Blake's voice though, so when they formed Jets To Brazil it was as if a tiny little musical wish of mine had been answered. When I first heard Orange Rhyming Dictionary I was also in college and hanging out a lot with an old friend of mine who shared similar musical interests. Our main group of choice was Sunny Day Real Estate (The Pink Album is forever a favorite) but when he put on "Sweet Avenue" one afternoon I was sold. That song remains as one of my all-time favorites but the entire album in particular is definitely one of my "perfect album" choices. Oh, Modern Life is War. Such a good band, but this is really the only album from them that I love. It's perfect to me though, and from beginning to end it totally speaks to me. It reminds me of being younger and driving around with Hank- we both just related to this album so much during that time. I still listen to it now and again, and it never fails to make me feel a bit of happy-nostalgia, but at the same time it also makes me incredibly sad. Two years after it was released one of our best friends passed away and this was the album I listened to non-stop during that time. It's a little hard to listen to some days, but it's also therapeutic to me and I'm so appreciative I had it during that time. Some other albums I love from beginning to end: Dr. Dre's 2001, Broadway Call's self-titled album, and Third Eye Blind's self-titled album. Someone's got a new look!